AFC Rushden & Diamonds’ trip to Rushall Olympic today (Saturday) has been postponed. A pitch inspection was called for this morning and with the surface still frozen, the Evo-Stik League South Premier Division Central match was called off. Diamonds don’t have to wait long to return to action, however, as they are due to take on Cogenhoe United in the semi-finals of the NFA Hillier Senior Cup at Hayden Road on Tuesday night. 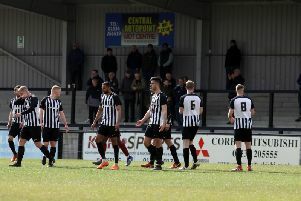 Corby Town’s Evo-Stik League South Division One Central clash at Barton Rovers has been also been postponed. The pitch was covered in a blanket of snow yesterday (Friday) and the inevitable was confirmed following a morning inspection. It means the Steelmen will now have to wait until next weekend to return to action when they are due to host Dunstable Town.